St. Louis Community Credit Union will host the February 22, meeting at their branch located at 6724 Page Ave, in Pagedale. The facility is a half block east of Ferguson Avenue on the south side of Page Avenue. ( MAP ). Refreshments will be available at 6:30 PM, and the meeting will begin at 7:15 PM. Read more about St. Louis Community Credit Union on page 2. PROGRAM: In 1936 the voters of Missouri adopted Amendment 4 to the constitution which established Article IV 40-42; the formation of the Missouri Department of Conservation (MDC) and the Missouri Conservation Commission. The Commission is vested with control, management, restoration, conservation, and regulation of fish, forest, and wildlife resources of the state. The Department of Conservation owns and oversees hatcheries, sanctuaries, refuges, and reservations, and enforces the state wildlife code. The Commission consists of four individuals appointed by the governor of the state to serve unpaid 6-year terms. No more than two of the individuals may be from the same political party. Their mission is to protect and manage the fish, forest, and wildlife resources of the state, to facilitate and provide opportunity for all citizens to use, enjoy, and learn about these resources. 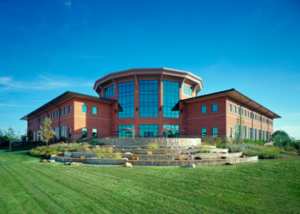 The Missouri Department of Conservation’s Community Conservation Program provides technical advice, planning assistance, and partnership opportunities to municipalities around the state. These “Conservation Communities” are interested in connecting citizens with nature through habitat improvement and responsible natural resource management. During this presentation, MDC staff will provide attendees with a brief introduction to grant programs, cost share funding, partnership opportunities and other helpful Community Conservation resources. Speaking for MDC: Urban Wildlife Biologist Erin Shank, Community Forester Mark Grueber, Community Conservation Planner, Josh Ward. These regional centers promote financial capability and give people an opportunity to gradually transition to mainstream banking services if desired, while paying much less for similar services on the street. The facilities are strategically located in densely populated, high traffic areas that currently feature payday lenders and check cashers as opposed to mainstream financial institutions. The idea is to create an oasis of sorts for the marginalized and disenfranchised people of our region by providing affordable options so they can get out of the endless cycle of debt and on the road to economic independence. The St. Louis County Extension Council is pleased to announce Councilman Dr. Sam Page, Saint Louis County Council Chair and Councilman for District 2, as the keynote speaker for the 2018 Annual Dinner and Fundraiser. Dr. Page was re-elected St. Louis County Council Chair for this year. He is committed to strengthening the St. Louis area, educating the community, and keeping everyone safe. His work on the Council has helped him identify strengths, opportunities and areas for improvement in the St. Louis area. Dr. Page received his under- graduate degree in Chemistry and Doctor of Medicine from the UMKC School of Medicine. He is currently a physician anesthesiolo-gist at Mercy Hospital in St. Louis and an Assistant Clinical Professor of Anesthesiology at St. Louis University Medical School. The health and well-being of residents in the Saint Louis area remains a top priority for his mission on the St. Louis County Council. He initiated and passed legislation to raise the legal age to purchase tobacco products to 21 in St. Louis County. In addition, he initiated and passed the Prescription Drug Monitoring Program in St. Louis County that now covers 80% of Missouri residents. He strives to support key programs that will enhance the health and viability of the St. Louis area. With his visible support and collabor-ation with St. Louis County, we will continue to grow the valuable pro-gramming throughout the St. Louis area. Together, we can continue the mission of the University of Missouri Extension in Saint Louis County. We invite all of St. Louis to come and be a part of MU Extension by attending the 2018 Annual Dinner and Fundraiser. We will be honoring constituents with partner recognition awards, displaying some of the work we continue to provide Saint Louis County residents, net-working, and enjoying a delicious buffet dinner. When: Friday, March 30, 2018 at 6:00 p.m.
At their meeting on February 1, the Municipal Park Grant Commission was presented with a unique request from a partnership of multiple municipalities and regional agencies. This collaborative effort sought consideration, outside of the Commission’s normal grant cycle, for a recreational project which would provide a significant regional benefit. The Commission agreed to accept a formal application for the project and also agreed to accept applications during the next two months from any other group of municipalities for regional, multi-jurisdictional projects if the group can demonstrate a justification for the special grant due to funding commitment or other extraordinary condition. All applications must meet the typical application criteria. If you are working with multiple municipalities on a park and recreation project of regional significance, consider sending in an application. Formal notices and more detailed information will be mailed to all municipalities. The application must be returned to the League office by 5:00 PM on March 30, 2018. Please note that the regular grant round in the summer will still be conducted. The Commission is also accepting applications for planning grants. The applications are available on the Commission website, www.muniparkgrants.com. 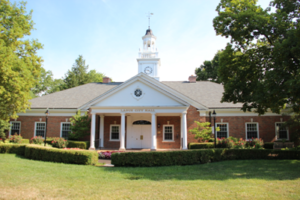 Applications received by April 20 will be reviewed by the Commissioners at their May meeting. If you have questions about the Planning Grant applications, please contact the Municipal League office at: 314-726-4748 or staff@stlmuni.org. 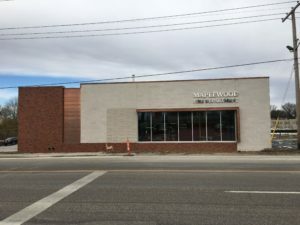 The Maplewood Firefighters moved into their long-awaited new headquarters last month. The building is located at 7601 Manchester Road, adjacent to City Hall. The new 18,897 square foot building replaces the 50 year old station which was antiquated and no longer met the needs of the department. 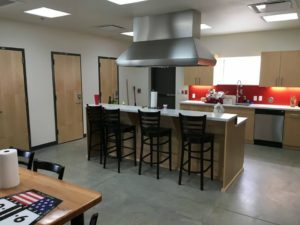 The first floor features offices, along with a training and multi-purpose room. Living quarters, a dayroom, kitchen and dining area will be located on the second floor. 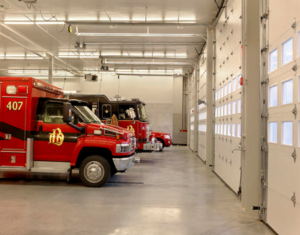 The fire station will also have three drive-through apparatus bays and a training tower. 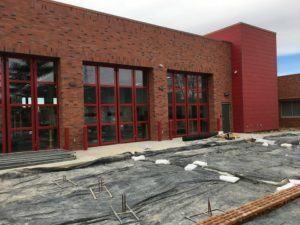 The facility is the first Fire Station in St. Louis to be built to achieve LEED Silver Certification. The Maplewood Fire Department has 21 full-time members consisting of the Fire Chief, three crews of six Firefighters each, one Firefighter that floats among the three crews, and a Fire Marshal that also serves as the city’s Building Official. All members of the Fire Department are either Firefighter / EMTs or Firefighter / Paramedics. One member is a Fire Marshal and Building Inspector. HB 1991 (Rhoads) – Enacts the Uniform Small Wireless Facility Deployment Act. Utilities Committee. Heard 1/24. We expect the bill to be reported out of committee the week of February 5. Negotiations are continuing with the sponsor and proponents to address municipal concerns. 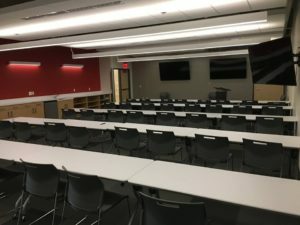 The challenges facing cities and counties regarding facility budgeting decisions is a complicated process, dominated by various use types, from City Hall’s to Courthouses to Recreation Facilities to Police and Fire Stations. How efficiently your building infrastructure operates during its lifetime and how its operation affects the lives inside, play a critical role in your strategic objectives and in meeting your annual budget. Decisions impacting the way building systems are upgraded, serviced, and maintained should consider the return on investment (ROI) that can be gained over time. Unfortunately, most cities are not in a position to think like this. Capital budgets stretch out 3-5 years and one of the most significant obstacles to upgrading building infrastructure is of course, having the up-front capital to do so and prioritizing this need over other city service needs. Because of this, a model of emergency and piecemeal equipment replacement has continued. How systems integrate with each other in each facility and campus wide, consideration for energy efficient choices and how infrastructure could improve the bottom line isn’t given much thought. Frankly, most cities lack the resources and technical capacity to assess their facilities to see where strategic improvements should be made. How could this be done differently? Enter ESCOs and RsMo 8.231.1. ESCOs are Energy Services Companies which provide comprehensive energy solutions and services to customers, including: assessing, redesigning, and implementing changes to the way organizations consume energy. The main goal of an ESCO is to assist with deceasing energy consumption which in turn lowers operating costs and improves overall facility performance. ESCOs have been around since the energy crisis in the late 1970s. In the early, 1990s, the cost of energy was rising again, deregulation was beginning and the availability of energy efficient technologies was rapidly changing, especially in lighting, HVAC and building management/controls systems. In the wake of the financial crisis of the 2000s, the ESCO marketplace evolved into a $4 billon industry. In the late 1990s, the State of Missouri along with many other states recognized the need to assist public entities with comprehensive facility improvements with a focus on energy conservation. The State legislature passed RsMO 8.231 – legislation on Guaranteed Energy Cost Savings Contracts – designed to financially facilitate improvements through a budget-neutral approach that reduces energy and operating costs. Under this statute, the savings in energy costs from the project are used to assist with cash flowing the project over the term (up to 15 years in Missouri). Many cities found that this procurement method was a more efficient and proactive way to budget over the long-term for building infrastructure needs. Performance contracting allows the entity to comprehensively address building needs and smooths the infrastructure costs out over the term. Since inception, hundreds of cities, counties, schools, universities, hospitals, state and federal building infrastructure projects have been procured using performance contracting. Residential and Commercial buildings account for nearly 40 percent of all energy consumed in the United States. This translates into billions of dollars being spent on energy consumption. The bottom line – do you know how your systems are performing? Is there opportunity for improvement in system integration, efficiency and energy savings? Consider the options that are available to help your city/county improve the operational and financial performance of your facilities. Bond Architects provides a wide range of architecture, interior design and planning solutions to municipalities across the region. Our projects, practice and people have been recognized for their commitment to enhancing communities and promoting sustainability. 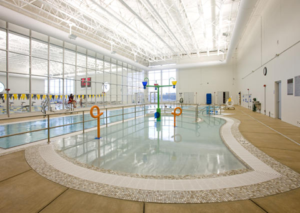 We are dedicated to maximizing energy efficiencies through advanced building control systems, climatically responsive layouts, waste reduction and natural daylighting practices. 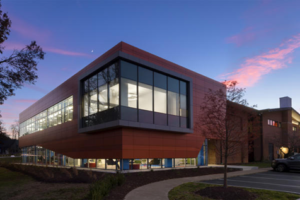 Located in St. Louis, Missouri, Bond Architects has been planning and designing innovative municipal spaces throughout the region for 25 years. Experienced designers, technical architects and collaborative managers lead every effort, providing diverse knowledge and unprecedented service that is vital to the success of every project. Bond Architects’ personal delivery method of continuous management and communication ensures we consistently meet budgets and schedules. Our responsibility to municipal clients and the communities they serve goes beyond creating handsome and functional spaces. As excellent stewards of public funds, Bond Architects will serve as your trusted advisor throughout all project phases, from community engagement to building close-out and beyond. Visit BondArchitectsInc.com to see how we can help make your vision a reality.